Most of you know that one of my main hobbies is training dogs and competing in dog training sports. The training of a new puppy begins the day it arrives home, and puppies learn incredibly quickly. By the time Delta or Dusty or Jaz were four months old, they could already do most of the things required for the first level of competition in dog obedience trials, although not consistently enough to bother entering them. Now the thing that is most amazing about that is that when I first began training dogs as a teenager, the conventional wisdom said that you couldn’t do much training with a dog until it was about six months of age. It was thought that prior to that pups were too immature to learn anything much. What we know now is that the problem was not with the pups but with the training method. A change of approach and a whole new world opened up – a world that was previously thought impossible, a world that was beyond the scope of our vision just a few decades ago. The people who announce new visions are often seen as nuts by others, as unrealistic dreamers. The people who developed the new approach to dog training are still ridiculed by some people. I was talking to a man in the park about it one day, and he said Yeah he’d seen the book but he didn’t think much of it, but when I showed him what my four month old pup could do, he thought he might go back and have another look at it. Something had happened – the scope of his vision had been stretched a bit further than it had previously gone. What sounded improbable and unrealistic was suddenly staring him in the face. When John the Baptiser appeared in the wilderness crying out “Prepare the way of the Lord. He’s coming right after me,” a lot of people thought he was a nut. Just another hairy fire brand living in the desert eating bush tucker and pretending to be Elijah the prophet. But John was announcing a new vision, a vision of one coming after him with the Holy Spirit to establish God’s culture of justice and righteousness and peace. Just another wild eyed idealist, they said, totally out of touch with reality. When Isaiah came announcing the vision we heard earlier, I imagine he got the same sort of reaction. The wolf will lie down with the lamb, the leopard will rest with the kid goat. The cat will curl up with the budgie, and the dingo will laze with the joey. The small child shall take a tiger snake for show and tell, and the politician shall speak in truth and humility. How can you ever believe such things. They’re not reality. They go against basic nature. They’ve never happened before. They defy comprehension. Isaiah was a nut, a few sandwiches short of a picnic. Or was he? It’s a very strange thing, reality. It is not nearly as fixed as we are used to thinking. Our beliefs about the limits of reality get very tangled up with what we expect or what we have experienced before. What is seen as way outside of reality in one place or time is taken for granted in another. People who thought you could train dogs at two months old were once “unrealistic”. People who thought that the world was round were once locked away because they’d clearly lost the ability to function in the “real” world. People who thought Nelson Mandela would one day be President used to be given a dose of “reality” in South African prison cells. If the President of the United States can shake hands with Cuba’s Castro, who’s to say the lion can’t lay down with the lamb? Beware of those who want to define reality for you. Beware of those who tell you what is or isn’t realistic. Beware of the politicians who say this is as good as it gets and anyone who wants more is unrealistic. Beware of the economists who say that only the naive and the stupid could believe that there could be economic recovery with higher priority given to hospitals and schools than casinos and car races and austerity measures. Beware of the pope who says it is not possible for women to be priests. Beware and be aware. If someone else is trying to define the limits of reality for you, ask what it is they have invested in the present reality. Why would they be threatened if we believed that something was possible that isn’t yet in place. Why do the forest industries tell us that investing in timber plantations instead of old growth forests is unrealistic? Why do the arms manufacturers tell us it’s unrealistic to talk of loving your enemies? There is money to be made. There is power to be maintained. There are vested interests to be protected. People can’t be allowed to believe that it could be possible for your product, or your regime, or your world view to become redundant. There is money coming from major drug cartels funding some of those who argue against the legalisation of heroin. They can’t afford for it to be available on prescription from the chemist. You’ve always got to ask who’s backing a particular view of the world, or even a particular moral principle. Hell hath no fury like a vested interest masquerading as a moral principle. This manipulation of our views of reality doesn’t just happen on the world stage over the big issues. I’m sure you’ve all been told it sometime by someone in your own particular circumstances. It can’t be done. It’s unrealistic to think you can change it. You’ll always be like that. That’s the way it’s always been. Get your head out of the clouds, this is the real world. This is the only place you’ll ever fit. This is your box and you might as well accept it. Get real. If somebody’s saying that to you, why is it that they can’t afford to let you escape from the cage of the old view of reality? Maybe its nothing more than the fear of seeing someone else achieve what they were afraid to try, but often its even more sinister. Always be wary of anyone who wants to define your dreams as being outside the realms of reality. Sometimes the difficulties we have embracing a new vision of reality are not external. They’re not always somebody else with a vested interest. Some of the demons are within us. Often we are just resigning ourselves to the inevitability of unchanging cycles. We have heard so often that history repeats itself and that the more things change the more they stay the same, that we take it for granted that the way things are is pretty much the only way they can be. Our experience of the world determines the limits of our vision. I’ve never seen a leopard change its spots, therefore it can’t. 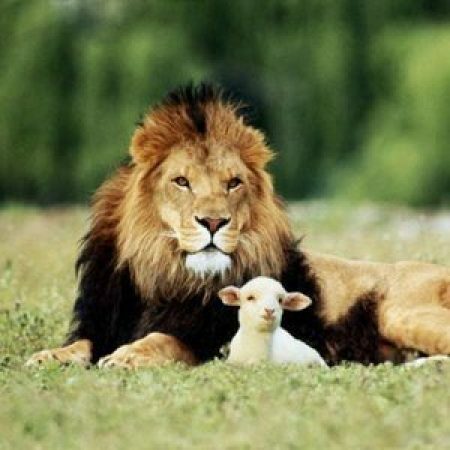 I’ve never seen the lion lay down with the lamb, therefore it couldn’t happen. I’ve never known someone you could really trust, therefore there isn’t anyone. I’ve never been able to change this pattern in my life before, therefore I never will. We end up as our own worst enemies with a mixture of fear and lack of vision conspiring from within us to hold us in the prison of our present circumstances. The voices whisper away within us. Every time you’ve tried to get out of this before you’ve failed. Don’t risk being a failure again. You can dream your dreams, but they’re only dreams. You always have to go back to reality when you wake up. Back to the real world where nothing ever changes. The realm of the possible, the extent of reality is always bigger than we think it is. We’ve gotten used to the fact that the impossible keeps on becoming possible in the world of science and technology. Well it can in the realms of psychology and personal relationships and social systems too. If your relationships have always been disasters, it doesn’t mean that you are incapable of good relationships. It may mean that you’ve been approaching them wrong. If a mountain climber fails to conquer a particular peak, they usually try a different route the next time. Just because it can’t be done this way doesn’t mean that it can’t be done. The fact that the hostility and bloodshed in Syria are still going doesn’t mean that the lion can never lay down with the lamb. It means that we haven’t found the way to peace yet. John the Baptiser was right. There was one coming after him who changed all the realities. No longer was it true that you were only acceptable to God if you were a descendent of Abraham. God could turn rocks into children of Abraham. The one who came after John said it could be possible if you could believe it and trust God for it. He called us to take up the vision of Isaiah, to look for the day when there would be justice for the needy and equity for the poor. Jesus lived and died to let us know that you can expect better than just more of the same. He was raised from the dead to show that even death no longer means the end of hope. Even death can no longer limit the scope of reality. Change and new life are not only possible in dramatic new ways here and now, but they are no longer even just confined to the here and now. Jesus the Christ has kicked open the doors of all our prisons. We are free to believe and strive for and achieve what was once believed impossible. But the prisoner whose dreams and vision have never extended beyond the closed door will be unable to face the prospect of venturing beyond it. For Jesus’s sake let’s not stay sitting in the back of our cells unwilling to go through the now open door because we’ve given up hoping that there might be anything on the other side of it. The same Jesus who burst open the door is also promising to travel with us in the unknown territory beyond the door. You may have never seen beyond the door, but there is a beautiful world waiting to welcome you there. A world where the lion will lay dawn with the lamb. A world where snake pits are safe playgrounds for children. A world of justice for the poor, freedom for the oppressed, and comfort for the broken hearted. Come, Lord Jesus, come.